The European Commission proposes to revise the Gas Directive to extend EU Internal Market rules to all import pipelines and hence apply the EU law on off-shore pipelines and extend the definition of “interconnector”. 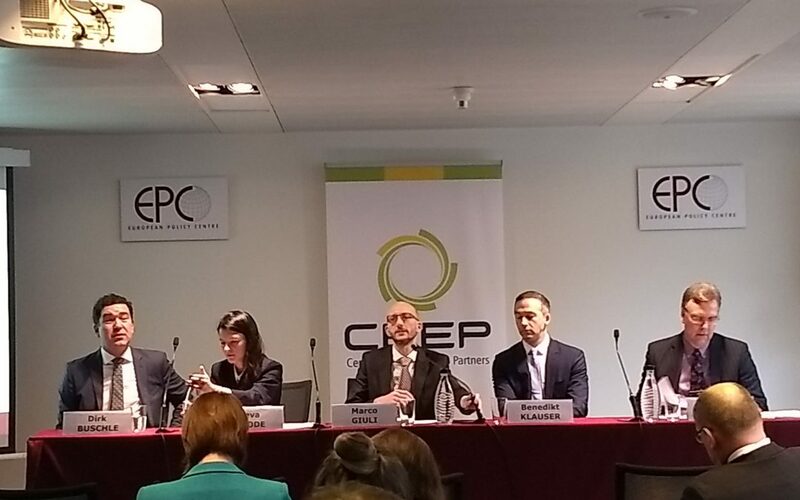 The proposal was discussed during the event “Reviewing the Gas Directive: opportunities and challenges”, jointly organised by Central Europe Energy Partners and the European Policy Center on the 16th of March, in Brussels. Speakers agreed that the proposed revision has an utmost importance for the coherent application of the EU energy law and the development of a competitive internal gas market. Such change provides investors with legal certainty and facilitates the dissemination of the EU energy law to Contracting Parties of the Energy Community. Benedikt Klauser, Policy Officer, Directorate-General for Energy, European Commission, explained that the idea behind the initiative is to have a common framework for all infrastructure projects, irrespective of the origin of the pipelines, hence increasing the legal clarity and ensuring a common level playing field for all market actors. Frank Umbach, Research Director, European Centre for Energy and Resource Security, explained that much was done to improve the functioning of the European gas market, but due to changes on the global gas market this is still not enough, as we don’t have an EU internal gas market – instead we have several regional markets, liquid north-west and monopolized by Gazprom south – east. Several interconnections still have not been implemented, particularly in South-Eastern Europe and if NS2 will be built, the commerciality and profitability of lacking interconnections would be even lower, which will further prevent their construction. He also pointed out that no European expert would doubt that we need Russian gas – we should, however, choose to which extent and under what kind of rules. One should not forget that the Gas Directive was from the very beginning a tool to achieve certain objectives, being based on the EU member states’ consensus around the idea of diversification of supply and reduction of Russian market share. The argument that NS2 should be left to the market forces, contradicts these political and security of supply and diversification objectives. Dirk Buschle, Deputy Director, Energy Community Secretariat, showed that it has become clear since 2011, when several Energy Community contracting parties implemented the 3rd Energy Package, that the definition of “interconnector” is not adequately described, as it does not allow the implementation of network codes as well as the use of solidarity principle, among others. He stressed that the recently proposed amendments are exactly what the Energy Community asks for to close the legal gap. Moreover, the establishment of joint institutions as last resource to rule on issues between EU member states and Contracting Parties would improve the governance functioning. Ieva Kuode, Director for development, EPSO-G, Lithuania, took the advantage to pinpoint that there is a pressing need to adopt the amendment to safeguard a coherent application of the EU law and that it’s interesting to see how painful this perspective is for market participants who are taking advantage from the existing regulatory grey zone. Identified blind spots should not be left unsolved.